Diego Costa and John Terry were on target for a Chelsea side who completely out-classed a frustrated West Ham in one of The Blues' best performances this season. Stamford Bridge was rightfully intrigued, just seconds away from kickoff which saw the league leaders battle Sam Allardyce's West Ham side, stunningly perched in fourth position. A minute applause, however, was rightfully mandated. 100 years ago since the Christmas Truce in World War I, saw players remember and fans vibrantly clap to remember. The Blues came tantalizingly close just a few minutes in. Willian loitered on the edge of Adrian's box, and cutely chipped, which saw a baffled Jenkinson completely blunder the ball, leaving Oscar alone to score. Shockingly, the Brazilian blootered straight over to a frustrating sigh from the home fans. After some fantastic football from Mourinho's men, they finally made it count. From a looping corner, Costa converts his header into a flick which sees Terry aggressively ram a tap in past Adrian. Matic, Oscar and Hazard's one touch passing had been absolutely sublime in the first, and with the Belgian's quick, nifty feet scorching around the box, Allardyce's men found it incredibly hard to combat. Costa picked the ball up, and fired a low attempt that almost caught Adrian out, but the Hammers' keeper displayed his terrific form and stopped the shot. After the break, West Ham resurged their football and it clearly showed. Valencia, their best player so far, whipped in a superb cross that was stupendously blundered by Courtois attempting a handed clearance. Agonizingly, the ball fell behind a retreating Carroll. Costa made it two, just following the hour mark. Absolutely superb. The Spaniard fiddles in between two Hammers defenders, twisting and turning, unleashing a quick, low, drilled but also powerful strike into the bottom right hand corner. On his weakest foot, Mourinho's first class striker proved his worth yet again. Amalfitano suddenly found himself on goal, and scooped to his left, however then back onto his right and fired a shot certain to fumble in but it shockingly hit the post. Full time, and dominant Chelsea comfortably dispatched West Ham, whom were isolated in their own half for a large part of the match. 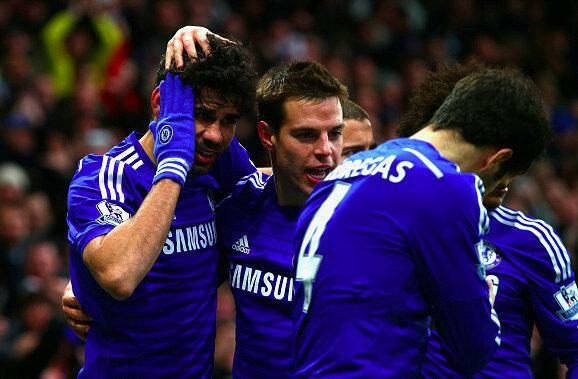 Costa, and Terry on target for Mourinho's men who provisionally go six points clear at the top.